The Tennessee Titan is king to a regeneration castle. 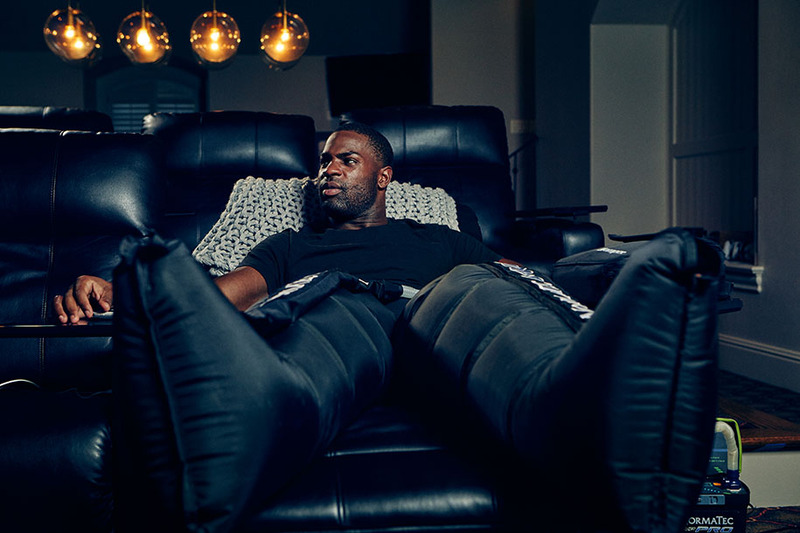 Perhaps it’s that famous Southern hospitality, or maybe due to the fact that he’s just a really nice guy, but Tennessee Titans running back DeMarco Murray is happy to have you at his Nashville home. “Come on in, I just got back from training,” he says, opening up his garage, sipping from a glass of 2 percent milk (his preferred recovery drink). At 6’1”, Murray is long and lean, with a quiet friendliness—there’s no cocky swagger here, despite the fact that he’s one of the most talented guys in the league. At home, Murray is a hands-on father of two who loves the laid-back lifestyle in Nashville, where downtown is just a 20-minute drive past beautiful horse farms and rolling green hills. But just because his home is a respite from his hyper-scheduled life doesn’t mean he goes out of athlete mode once he walks across the welcome mat. In fact, Murray’s house is a performance facility in and of itself, with almost every room featuring a design or piece of equipment that will help him be at his best. 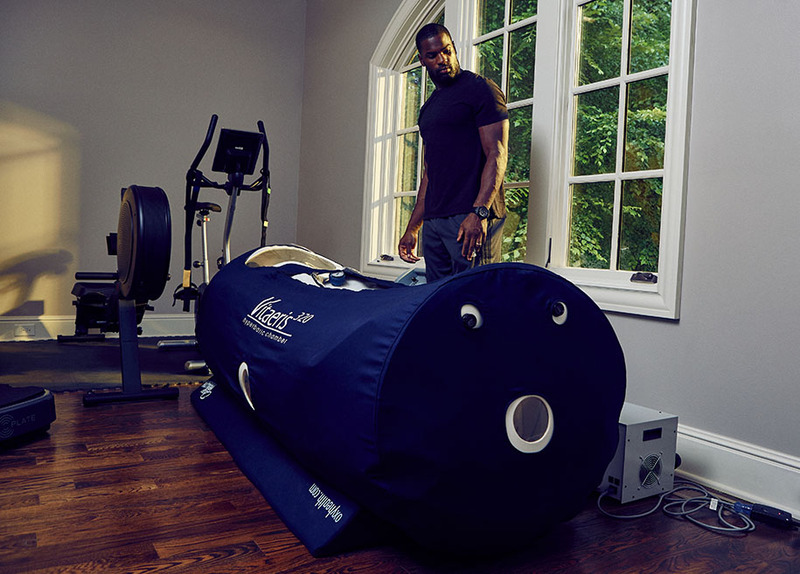 Perhaps the most high-tech of all of Murray’s at-home regeneration equipment is his home gym’s hyperbaric oxygen chamber. “About four or five days a week, after I put my kids to bed, I try to spend at least two hours in here, ideally sleeping,” he says. Inside the chamber, air pressure is increased to up the amount of oxygen Murray can breathe in through his lungs. Proponents say that increasing oxygen levels in the blood promotes healing and recovery. “It’s tough to make the time, but sometimes I’ll sleep four or five hours in here, never less than two,” says Murray. “I’ve slept through the night before, too.” If he can’t conk out, an iPad or his phone helps pass the time. Murray’s healthy diet relies heavily on lean proteins like chicken, steak, salmon and the occasional sea bass, so his poolside grill gets a lot of play. “My wife does the prep, and I throw things on the grill,” he says. “I stick mostly to steak and chicken, some corn on the cob in the husk, but when we have friends and family over, we’ll definitely do some ribs.” When he’s burning more calories in season, he’ll allow himself an occasional cheat meal; among his favorites is an Angus beef burger from Nashville’s Jack Brown’s Beer & Burger Joint. An organized closet is a total statement piece, and Murray’s is a thing of beauty. And it’s no accident: twice a week, a professional comes to Murray’s home to keep his walk-in right and tight. Beyond the aesthetic payoff, Murray gleans mental clarity from his color-coordinated set-up. “Being organized is just easier, it helps you breathe,” he says. And while his home hub houses everything from dress shirts to his extensive Yeezy collection—he owns every edition—he applies this Zen mentality at the stadium. “My locker is definitely one of the most organized on the team,” he says, with a laugh.